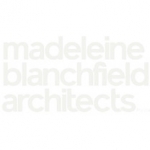 非常感谢来自 Madeleine Blanchfield Architects 对gooood的分享。 更多关于他们：Madeleine Blanchfield Architects on gooood. The clients brief was for a robust and liveable home for a young family with light filled and uplifting spaces and calm materiality. The house seeks to create a sense of spaciousness and outlook on a difficult site which is steep, long, narrow, has a mono-directional view and is surrounded by many adjoining neighbours. Courtyards are used to bring in northern light, respect neighbours privacy, provide good solar access and sun-shading. They give optional visual and acoustic separation between rooms while borrowing views through other spaces. 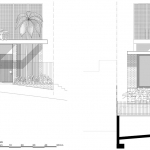 Layers of open and glassy spaces on the lower level step down the site and minimise the perceived steepness. The house has a consistent awning level that separates the upper and lower form. The lower level ceiling it is kept a consistent height as the floor drops away to the rear garden creating a sense of increasing volume. In keeping with the brief, space and light are the features of the home. A pared back material palette and tones allow the volumes to dominate. 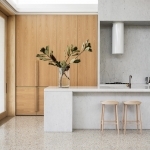 The simple palette is made richer with textured finishes such as rough-laid white painted brickwork and rough cut stone. The interiors are completely integral to the house. Timber veneer walls are matched to the structure and windows so that the line between interior and exterior is blurred. 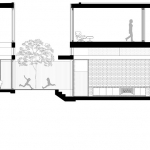 The upper level is shrouded in perforated screens, which provide privacy from neighbours and a sense of containment to the more private bedroom and study spaces. The screens throw beautiful, changing shadows and are a strong feature both internally and externally. The context is of modern neighbouring dwellings and little vegetation. The local character is unimpressive, with new houses lacking finesse and building forms unsophisticated. 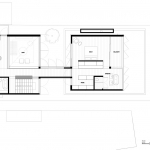 The house sits humbly in the streetscape with a landscaped roof to the garage and set back upper level. The perforated screens to bedrooms create a simple backdrop for the roof planting and have a soft glow at night. The predicament of a double garage on the street is dealt with by integrating the door and using it as part of the facade treatment. Landscape is also integrated throughout the house. The brief for a robust family home has been met with great success. The use of indoor- outdoor rooms and cross viewing provide the separation desired between spaces while maintaining visual connection and view sharing. The use of space, light and materials including double height voids and extreme ceiling heights create a home that feels much bigger than it is. The concrete structure includes large spans, minimal thicknesses and complex connections. Post tensioning was required as was casting in of fixtures and fittings. Close collaboration with the project engineer and builder was required. The house was built cost-effectively. The use of equitone screens, a rendered concrete frame and simple detailing minimized construction costs. Details are intentionally robust so that the materials and junctions can handle some imperfection. The materials and craftsmen available were used to the most advantage. 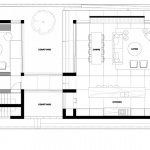 The primary sustainable principle of the house is the use of orientation and sun-shading to determine the layout and consequently the form. The site faces due east and the house is designed for the best solar orientation, thermal mass, sun shading and cross ventilation. It is comfortable, robust and its greatest contribution to sustainability other than its performance will be its longevity. 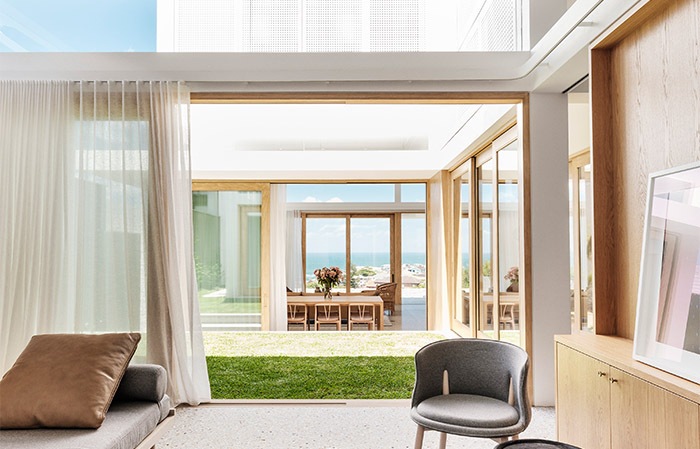 Awnings, courtyards, screens and windows are all designed around maximising the performance of the home and its sense of warmth, light, ventilation and thermal comfort. Rather than applying random shapes to the building, passive solar design features derive the aesthetic of the home and give shape to the architecture. 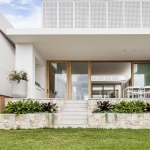 Rainwater tanks, solar panels, hydronic heating, low energy fittings and the absence of air conditioning all support the performance of the home. More: Madeleine Blanchfield Architects 更多关于他们：Madeleine Blanchfield Architects on gooood.